There are a lot of researches and studies being made today to see whether filtered tap water is better than purified bottled waters. Because of the results of these studies, many people have considered choosing filtered tap water. Filtering your tap water may seem easy to do, but you still need to choose what type of filtration system you will use in order to make your tap water clean. There are many water filtration systems out there and they have their own advantages and disadvantages. Distillation – The water is heated in boiling temperature, the vapour that rises is then met with cooling water to lower the heat temperature. The vapour that is cooled is then condensed, collected, stored and later on ready for drinking. Ion Exchange – It exchanges ions found in the tap water and exchanges them to the ions in the filtering machine. It effectively dissolves unwanted inorganics in the water. Carbon Absorption – It removes any unwanted odors and tastes from tap water. It removes effectively many gases and chemicals that are included in the development of tap water. Some of the chemicals that it removes are: chlorine, cysts, lead, coliform and even asbestos. Microporous Basic Filtration – There are three forms of filtration in this method. First, depth, it compresses materials and fibers and retains large amount of particles. Second, screen filter; it retains any large particles in the water. And lastly, surface filtration, it has multiple layers that retain larger particles that couldn’t get inside the spaces. Reverse Osmosis – It uses semipermeable membrane that filters compounds and other contaminants. If the said particle has a larger size compared to the membrane, it is then retained in the filter. Ultraviolet radiation – It uses germicidal treatment to filter the water. Out of all the methods that are mentioned above, the reverse osmosis (RO) is the most commonly used by many people because it is very economical. It also removes almost 90-99% of all the chemicals and contaminants. The reverse osmosis filtration method is known to remove harmful chemicals that are included in tap water. It effectively removes arsenic, lead, nitrates and fluoride. Many researches was performed to know the advantages and disadvantages of the RO filtration system. Lead-free water – Filtered water using the RO system is known to remove any lead in tap water making it safe for drinking. If excess lead goes inside the body, it could lead to fertility problems, increase in blood pressure, and damage in the development of the muscles and nerves. It is known to be safe for patients who have cancer – When a cancer patient undergoes chemotherapy or radiation, they can have low immune system. The RO system exterminates germs and micro-organisms that could be harmful to these people. Removes sodium – People who have high blood pressure or liver and kidney disease could benefit in drinking water filtered with reverse osmosis system because it takes out sodium in the water. Demineralized water – Because of its filtration system, it takes out all the chemicals in the water, including good minerals. Natural water includes chemicals like iron, magnesium, sodium and calcium and the RO system removes all of these which could not be good. The water becomes acidic – When you remove all the good chemicals in the water, it then becomes acidic which is harmful to any human. When you choose to use the RO system, make sure to use trace minerals or supplements that will bring back the good minerals in your water. This is important so that your body will have a good pH balance. I didn’t know that reverse osmosis is the most commonly used method to filter water. 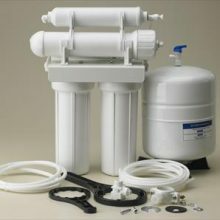 I need to get a new water filter, and water softener for my house and was looking into my options. Thanks for this info on reverse osmosis I will be looking in to having a system installed.